When fitting a bridle to a horse, you want to first measure your horses head length from an inch above the corner of the mouth, over the top of his head to an inch above the corner of the mouth. When ordering a bridle, you want to choose the size which best accommodates a variety of bits for your horse from snaffle to curb bit. Always allow 2 inches on each cheek adjustment (2 holes) for flexibility. When putting a new bridle on your horse, let the adjustments out so that you are sure it is plenty big enough to go on easily over the ears. Keep your horse comfortable at all times. Once you have placed the bit in the horse’s mouth and slid the crownpiece over the ears, adjust the cheeks so that there are 1 – 2 wrinkles in the corner of the horse’s mouth. Try to have the same hole adjustment on both sides or within 1 hole. Make sure to pull the foretop clear of the bridle or tuck it neatly in the center of the horse’s forehead. Keep the bridle path clipped short so that the mane does not interfere with the fit of the bridle. The browband should be level across the horse's forehead and placed in the natural grooves just under the ears. The caveson should be straight across the nose and just low enough to place 1 – 2 fingers between the caveson and cheek bones. If a curb bit is used, adjustment of the curb strap or chain should be determined by how much flexion the shanks of the bit has. The shanks should never be so tight that the shanks can not flex toward the horse’s neck. 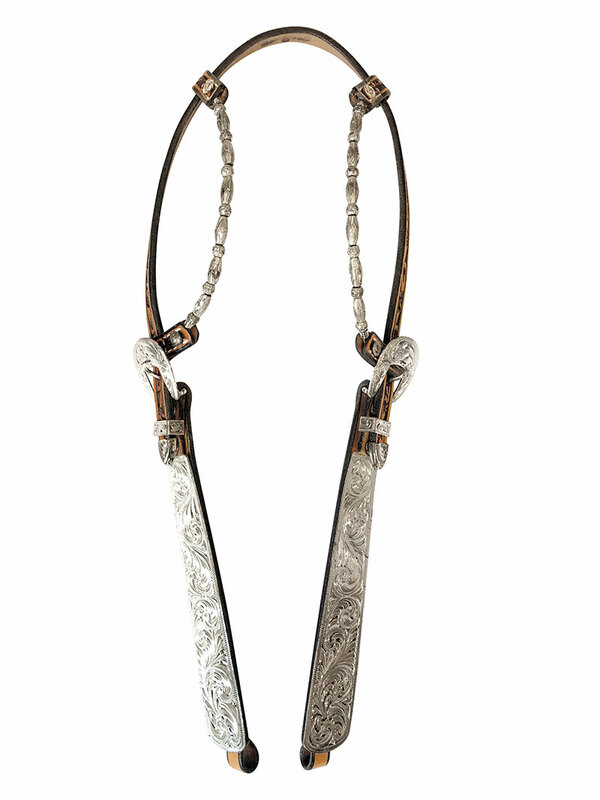 Always make sure to put the strap ends in the keepers so that the bridle is neat and unobstructive on the horse’s face.